Flavio is a very friendly man. He was born 36 years ago in Brazil, some 100 miles from Brasilia, the capital. He decided to come to Amsterdam when he was almost 30 years old. He finished his bachelor in Marketing. Flavio had two jobs, and no time whatsoever to spend the money he earned. 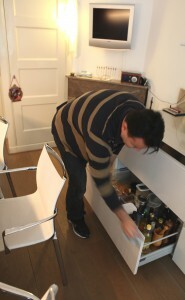 Now, working as a cleaner in Europe, he has a nice house with a lovely garden in a quiet little village near Utrecht. Working in people’s homes, he is his own boss. He loves his work. And he is proud of what he has achieved so far. ‘I did this all by myself, it wasn’t easy, nobody helped me, nobody said: ‘Flavio, I will do this and that for you.’ I paid a lot to Immigration to have my legal status here. ‘I have too many employers, I always have enough work. You should just love your work, pay attention to whatever it is you do.’ The money is not bad, and he makes a good living. One of his employers loved him and his work so much he paid for his weekly ticket to Barcelona. One of his employers is Eva, who owns a beautiful stylish house with a garden in Amsterdam. She likes Flavio, but prefers to go out when he comes in to work. ‘I can’t stand the sound of hovering,’ she says. They laugh a lot. ‘You should write down I hit him,’ says Eva to me with a broad smile. 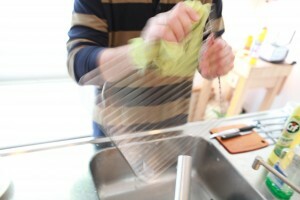 Flavio, while cleaning the kitchen, laughs loudly. Eva suggests we take pictures in the garden, so he can send one to his mother too. Flavio puts on another shirt. They pose holding each other, near a statue of a dancing couple. A bit awkward at first, but more at ease later.